This one is kinda complicated, I admit. Unfortunately, I didn’t really take the time to clean up the spreadsheet file for others to follow (I don’t really have the time these days). Sorry. But try to take it apart – and ask me questions if you have them. I’ve canvassed some other folks from the Excel community to see if they would want to do a video tutorial of this – and I think that’s what it would take. This entry was posted in Advanced Excel, Data Visualizations, Rollovers, VBA on August 29, 2012 by Jordan G.
So, as usual, I’ve been experimenting more with the rollover technique. Last night, I started experimenting with adding the capability to rollover a point on a chart (instead of just a worksheet cell) to see if I could have a label appear – or just some event fire – upon the mouse entering a chart’s datapoint’s “hotspot.” The goal was to improve upon previous attempts to provide details-on-demand for charts. Such attempts usually required that you create a reference to a chart object and use chart sheets. Personally, I don’t like chart sheets. Because I’m now writing a book, I don’t really have time to go through what I did at length. But here’s a short summary. 2. With each cell the same size, I now had a grid that I could turn into”hot spots” for the mouse rollover. I laid out my chart to use 36 (0 – 35) squares horizontally and 17 (0 – 16) vertically. There was really no good reason for why I picked these numbers; my choice was pretty arbitrary. However, for this method, the more squares you use, the more hotspots you create; thus, more squares means more precision. 4. I didn’t want the user to be able to click on the graph and change its values. So I took a shape and placed it on top of the graph and assigned it to fire a macro on click. You can’t see the shape because the fill color is fully transparent. Reread that last sentence and note that I did not say I used “no fill color.” When you assign a macro to a shape, if you select “no fill,” Excel lets you select anything that is contained by the shape as if it’s not there. That would mean the user would be able to select the graph, which is exactly what I didn’t want. For the shape above, I simply set its transparency to 100%. 5. Finally, to make a long story short, the shape when clicked fires the macro that allows the user to draw the rectangle. I know right now my work isn’t perfect (some data points aren’t selectable for example depending upon where you start the rectangle), but I like what I have now and don’t have much more time to work on it. I’ll leave it to you to put it to good use. Let me know if you make something cool. 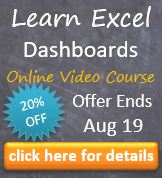 This entry was posted in Advanced Excel, Dashboards, Rollovers, VBA on August 28, 2012 by Jordan G.
I am an enthousiast reader of the blog ‘Option Explicit’. I changed the formula (see below) and made a version for showing Years and Months. Now you can use this tool for Management Information. This fantastic tool, combined with Named Dynamic Ranges gives the ultimate solution for making awesome interactive dynamic Excel charts. As soon as possible I will show you an example. This entry was posted in Advanced Excel, Project Management, Rollovers on August 19, 2012 by Jordan G.
Needs More Rollover: Quick Tip! More people are interested in Excel mouse rollovers, which I think is great. I’m especially enthusiastic about Chandoo’s latest dashboard contest where I found out that several contestants used the technique! By the way, there are many great dashboards showcased in the contest. Take a look and make sure to vote! If you place your mouse over the cell with the HYPERLINK formula that calls this function, the range valSelOption will be continuously written to. This becomes a problem when there’s a lot of complex interaction on your spreadsheet. If, for example, you’ve used a lot of volatile functions (like OFFSET or VLOOKUP), continuously writing to the sheet will mean a recalculation for each cell with the volatile function. Nobody likes a slow spreadsheet. In the above code, I test if valSelOption already equals seriesName.Value. If it does, then we do nothing; if not, we write to it so that the next time the function is called with the same value in its argument (which is unpreventable if your mouse is over a cell for even a brief moment second), we can again, relax and do nothing. Thats it! You’ll likely see an immediate speed improvement, especially if you’re doing lots of complex stuff with your rollover, like a this. This entry was posted in Advanced Excel, Development, Rollovers, Tips, VBA on August 8, 2012 by Jordan G.